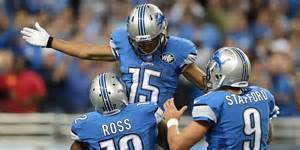 Could the Lions end a 23-year division title drought in 2016? Can you name the four NFL teams that have not won a division title this century (since 2000)? With three weeks remaining in the NFL regular season, none of the division champions have clinched a title, although two teams, New England and Seattle, each have three-game leads with three games to play. The AFC South, NFC South and AFC West each have a tie for the top spot, and the other three division leaders have either a one or two-game lead. While perennial divisions champs like the Patriots and the Seahawks are ready to claim another title, there are a few new teams challenging for a division title. Three teams in particular, the Detroit Lions, Tampa Bay Bucs and Oakland Raiders, each are right in the thick of things and could win their first titles in a long time. Speaking of waiting a long time for a divisional title, the hapless Cleveland Browns, now nursing an 0-13 record, will certainly not win the AFC North this season (or maybe anytime in the near future). In fact, they have not won a division crown since 1989, the longest drought of any NFL team for a division championship. Here’s a look at the last time each NFL team won a divisional title. (Did you get the four teams (Cleveland, Detroit, Buffalo and Jacksonville) correct? Note: There has been only one division where each of the four teams has won a crown since 2010… the NFC East (Dallas-2014, NY Giants-2011, Philadelphia-2013 and Washington-2015).